One of the most popular methods to explain features of a product is using an audio-visual medium. There is a wide range from simple 2D animation to high end 3D animations and video shooting in full HD [1920 by 1080]. You can read our guide on corporate film making. While product photography is popular and common for e-commerce based websites, product videos take the level of engagement with the target audience to the next level. Depending on the various factors like time allotted, budgets and the message to be conveyed by the company, any of these 12 popular videos can be used. The simplest start from a video testimonial of product with a few photographs of product added in the editing to a high level 3D animation with voice over and background music. The typical duration of the video should be between 120 second to 180 seconds, to keep the audience engaged and convey the product/service Unique Selling Points (USP). It is generally a good idea, to focus on one product / service in each video, rather than trying to club multiple products and lose the focus and attention of the audience. 2D Animation - Basic Level - These type of 2D animations are very popular with companies and small/medium enterprises who are on shoe-string budget and yet want a video presentation of their goods/services. The popular 2D animations software are: Sketching Tools, Bone Rigging, Layers, Onion Skinning, Frames, Color Palettes, Timeline, Convert to Vector Image, Brush Tool, Draw Freehand, Create Animation Paths and Trace Image. 2D Animation - Advanced level with Voice Over - These animations involve professional voice over (VO) recording done in an audio recording studio with the complete setup for recording high quality stereo audio. Background music is also added in the final stage to give professional touch. The editing of these video is typically done in software tools like Adobe Premier on Windows platform or Final Cut Pro on iOS platforms. 3D Animation with/without Voice Over - Creating 3D animation video are more complex than 2D animation and in many cases (depending on the level of details) more than a, actual video shoot. A typical 3D animation involves software for : Modelling, texture and materials and animation features. Popular software are: Autodesk Maya, Autodesk 3ds Max, Autodesk Softimage, CINEMA 4D, Houdini and Light Wave. The biggest advantage is that the end viewer get to view the 360 degree rotation of the product. These demonstrate the complete features of the product and allows the viewer to understand the complex features that can be illustrated with graphics or text supers. The Voice Over also, adds to the explanation of the features of the product / service. Live Action - Person talking and explaining a product / service. This is one of the simplest and easiest manner to create a product demo video. The background is generally white or corporate branding can be used create a professional effect. In addition to the person talking, professional voice over, text supers and animations can be used to explain the product characteristics and features. Depending on the industry and type of product being demonstrated, a suitable environment is created. For example, in demo for a medical device, the demonstrator is dressed in the proper attire with latex gloves, green surgical gown and face mask. Moving Typography - Text and Animations with Voice Over.- Moving typography is also known as kinetic typography. These type of demonstration videos use text and motion to explain the features and qualities of the product / service. If used in innovative manner, a moving typography can have a good impression over the viewer. Combined with professional voice over and background score, we can create high impact short demo videos. Adobe After Effects is one of the most popular software to create professional moving typography videos. It is a good idea use to use maximum of 2 or 3 fonts, with simple white / black background, so that the emphasis on the content and the view is not distracted by background graphics / design elements. For audio effects and background music, stock music and audio effects can be purchased from various sources and incorporated in the video. Animated Screencast - Capturing video of the screen with Voice Over. - This is one of the most effective methods to showcase demonstration of web based or local software products or services. A screencasting software like Camtasia Studio is used to the capture the action happening on screen. The text typed with keyboard as well as the mouse movements are captured. Once the screen capturing is completed, the video editing stage includes adding background music, professional voice over and visual effects. Stop Motion - With Character animation - Also known as stop frame, this video animation is an animation technique to make a physically manipulated object or persona appear to move on its own. The object is moved in small increments between individually photographed frames, creating the illusion of movement when the series of frames is played as a continuous sequence. 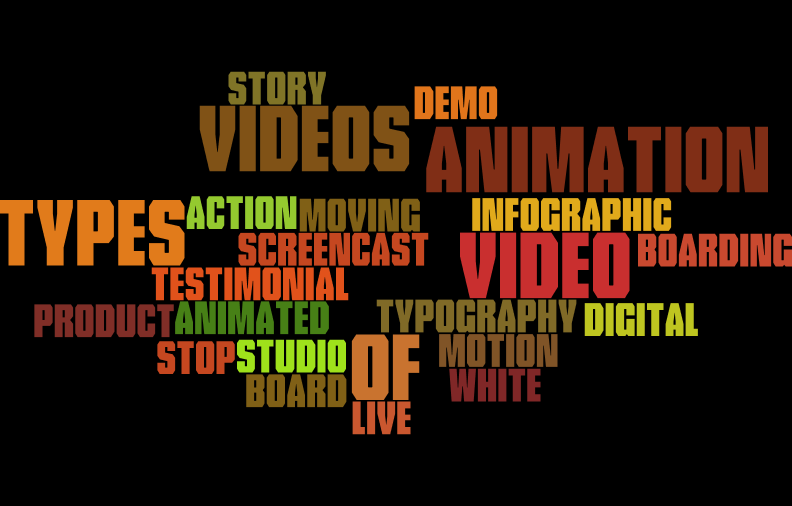 Video Infographic - Video shoot of a person along with animations. - A high level of video production which involves video shoot, voice over, animations and graphics. The predominate feature of these videos is graphics and a presenter to demonstrate the product or speak about the services of a company. IPad/iPhone - Apps dedicated to deliver training/demos - These are relatively new type of videos that are showcased on small screens and utilise low bandwidth. Any of the above mentioned video making tools / types can be incorporated in these demo apps. Care should be taken, to make the final video effective as well as small is size, as most users are not comfortable downloading very large apps / videos on their mobile / hand held devices. Video Testimonial - A person talking about a specific service/product - One of the popular manners to illustrate the highlights of a product / service is by capturing a video shoot of an actual user of the product / service. These videos are very effective in conveying the message of trust, reliability and ease of use of the product. Many FMGC companies rely on video testimonials to convey the trust worthiness of their products. Video testimonials are also used in fields like medicine and law where trust is of paramount importance.